OOC for this thread full of lies, mysteries, and above all literature! Feel free to come up with how your Characters arrived on the scene. And toss in any roles you wish to take in here. Of note, CSI and police officers are still on the scene. And officers are interviewing staff and room neighbors. Tagging, some rolls incoming. IC post pending how the rolls play out. EDIT: Roll time! I'm shooting for the classic "Batman suddenly appears in the middle of the crime scene" thing. He's going to activate his Infiltration Gear; lets him slip in unseen, and Trackless should reduce his contamination of the crime scene! Stealth: 15; he has full Visual Concealment, for whatever that's worth. We'll say he went up the side of the building as much as possible. Notice: 27; just to see what's going on in general on the scene. So basically NEVERMORE SEES ALL, but probably someone spots or hears him in return? I'll hold off on Search or Investigate for now, this is about dramatic setup. FYI @HG Morrison , I can post IC but I wasn't sure if you were going to let me know how successful or not the above checks were. I was meaning to earlier today. But, got caught up trying to fix my heater. You'll have a response of the results in the morn! First thing in the morning I promise! Alright no one spots Nevermore. The best way in would be via the balcony. Whole lot of climbing (or swinging) but he'd be unseen. Alright as to what he sees. Police and reporters are all over the place. Interviewing people and the like. Heavy traffic in the area has made the location quite dense for moving about. Despite the big messy room, there seems to be no signs of someone leaving the room. There are cameras all over the hotel and nearby buildings. Nevermore is going to configure his Gadgets to Detective Visor and Palmtop Computer. He is then going to move to the balcony and slip inside. Once inside, he'll make a Computers Check (23) to access the security camera network and begin trying to pull up recent videos along any and all paths to the room, as well as the balcony if possible. Then he will begin Investigating (33) the crime scene, using a combination of his wide range of Vision modes as well as the forensic tools he always has on hand. Wow; crappy roll on the die, but luckily her bonus is still insane! For what it's worth, Heritage, with that check you could actually see Nevermore. He's good but my roll was pretty low, and he's not using a Concealment power or the like. I'd be fine with her spotting him, since he's not actually invisible or anything. Oh, I thought he had Concealment 4, but does he not have that anymore since he reconfigured his Gadget? Correct. His Gadget pool isn't deep enough yet. Notice Check vs. Grimm: 28. Really good, but not good enough. To answer what you'd asked in Chat that I never got a chance to answer, Heritage, here is Nevermore's Reputation entry, and his suit is currently based off of the Arkham Asylum Batsuit. Nevermore's costume is a finely-engineered piece of crime-fighting technology, and it looks it. It's a full-body suit that leaves only the mouth exposed, and while it's somewhat obvious that it's multiple layers, the outside is virtually seamless. The whole suit has armor plating somewhat visibly sandwiched in everywhere, but covered with a solid layer of morphic molecules on the outside to smooth over its appearance. The suit's base color is black, with the belt (holding several secure pouches of equipment), chest symbol (a stylized "N"), and a few lines on the gauntlets and greaves being a metallic silvery color. The inside of his cape is a dark grey-blue, helping blend in and break colors up a bit.The gloves/gauntlets, boots/greaves, pants, shirt, cape, and cowl are all separate pieces. When at rest, the cape's edge is a straight line, but thanks to the combination of the electroreactive "frame" inside of it, and the morphic molecules, when in "glide mode", the edges take on the appearance of a raven's wings spread in flight, or at least a stylized rendition of it. 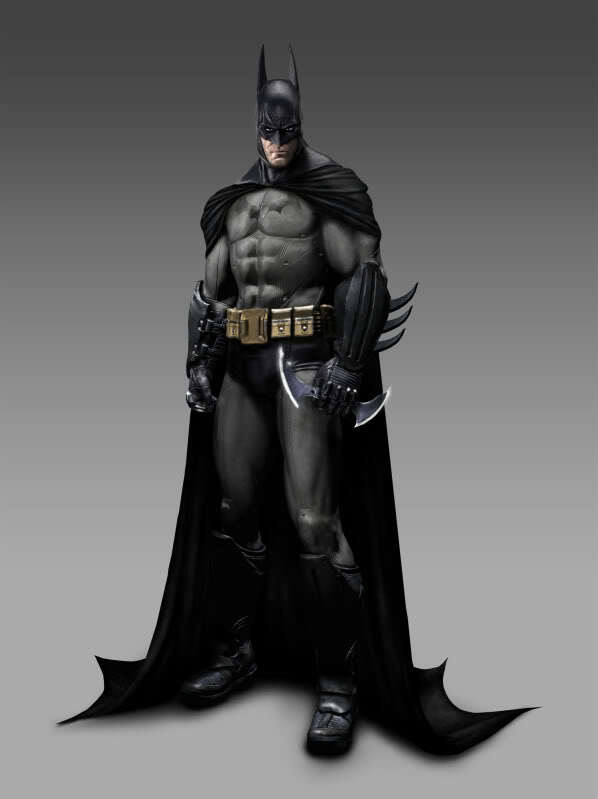 His head is covered by a smooth armored cowl that leaves only his mouth and chin exposed to the air. His eyes are covered by special lenses that appear, from the outside, to be somewhat milky-white when inactive, but faintly glow green when night vision mode is active. Recently Aleksander has added a very robust belt-and-harness assembly that includes a multitude of pieces of compact equipment. Using low-scale nanotechnology alongside hyper-efficient space-saving tech, these modules and pieces of equipment can quickly be activated and deployed, be it as handheld tools or as plug-in modules on his base suit (which has a multitude of subtle connection points for various modules). Some may alter the appearance of his suit in various ways. Okay, my post is now edited. Should I be rolling things? I don't know. If you want to detect Grim and Nevermore, might want to roll for Notice? Not sure if you should roll anything for interaction with the detective. Yeah. Won't speak for HGM about the cops, but to actually see/detect Nevermore I'd prefer a roll be made (even if his Stealth was not the greatest). Wasn't asking about that, necessarily. You two were just a rollin' away and I wonder if I should, I dunno, join in?